Coconut + Cocoa nib! That sounds like a winning combination, right? 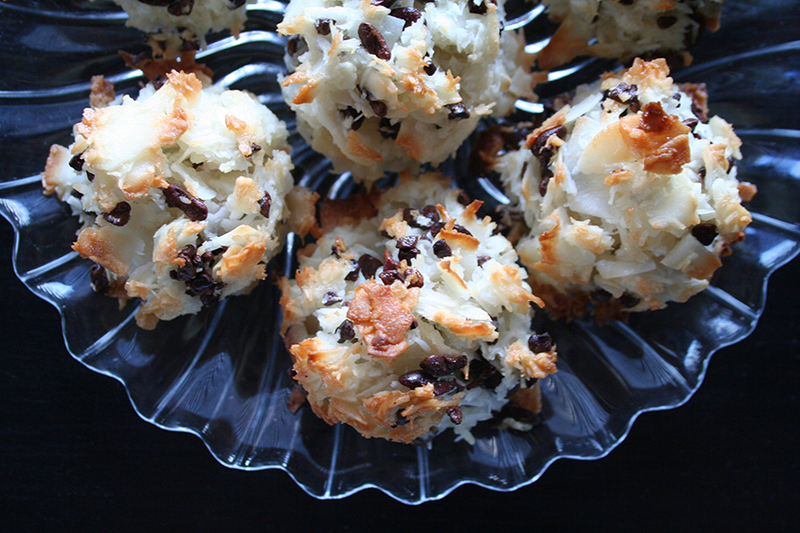 These macaroons are absolutely delightful, and are extremely adaptable. 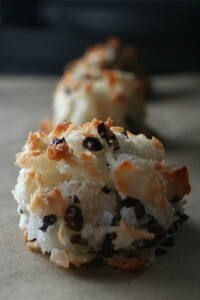 Feel free to add what you like to these macaroons, whether it’s chocolate, fruit or nuts. Next time we are going to turn these into Almond Joy Macaroons, by adding 1/2 tsp almond extract and substituting chocolate morsels for the cocoa nibs! 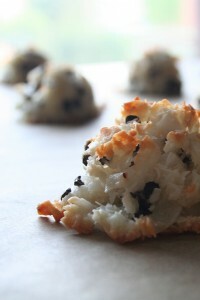 If you are a fan of crispy macaroons increase the amount of shredded coconut. Or if you prefer a more meringue like macaroon, whisk the egg whites in a standing mixer until they hold soft peaks, then gradually add the sugar until it holds stiff peaks. Whisk in the vanilla and salt, then fold in the coconut by hand. Preheat oven to 350°F, and line two baking trays with baking paper. In a large bowl, lightly whisk together the egg whites, extract, salt and sugar. Add the coconut and cocoa nibs, stirring to combine. Scoop a tablespoon’s worth of the mixture onto the lined baking tray. Bake for 5 minutes at 350°F, turn oven temperature down to 325°F, rotate pans and cook an additional 5-15 minutes, until the macaroons are golden brown on the outside. Check your macaroons 5 minutes into the second baking cycle. 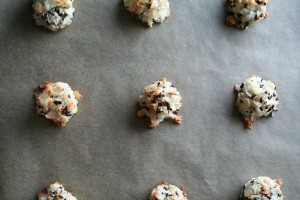 If your macaroons are browning to fast, turn the oven down to 300°F. The length of additional baking time is dependent on your macaroon preference. The longer you bake the crispier and drier they will be. Be careful not to burn! Let the macaroons cool before moving them from the trays, as they’re quite delicate while warm. 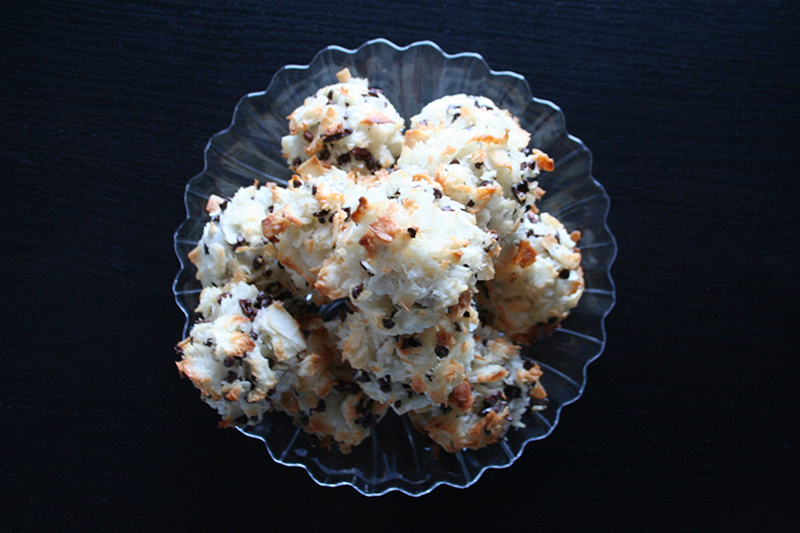 *We used 1½ cups unsweetened coconut chips and ½ cup unsweetened shredded coconut. If you only have sweetened coconut on hand, cut the added sugar in half. Macaroons are best served the day that they are baked, but can be stored in an airtight container, at room temp for up to 3 days.